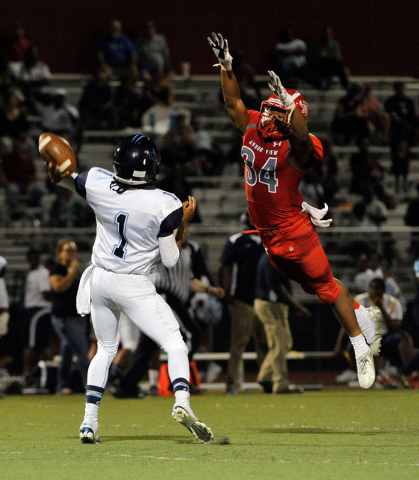 Arbor View football coach Dan Barnson knew he had some banged-up players Friday, but he never doubted that depth would lead his squad to a victory. Barnson was right, as his third-ranked Aggies manhandled No. 6 Canyon Springs early en route to a 44-14 home victory. Herman Gray, who rushed 15 times for 126 yards to lead Arbor View, scored twice in the first six minutes to give his team a 14-0 lead and all the momentum it would need. The Pioneers made it easy for Arbor View in the first quarter, as a blocked punt, a fumble and a short punt led to the Aggies’ first three touchdowns. Barnson said field position was a key throughout the first half. Noah Noce scored on a 12-yard pass from Bryce Poster late in the first quarter, and he added a score with a 12-yard run early in the second to give the Aggies a 27-0 lead. 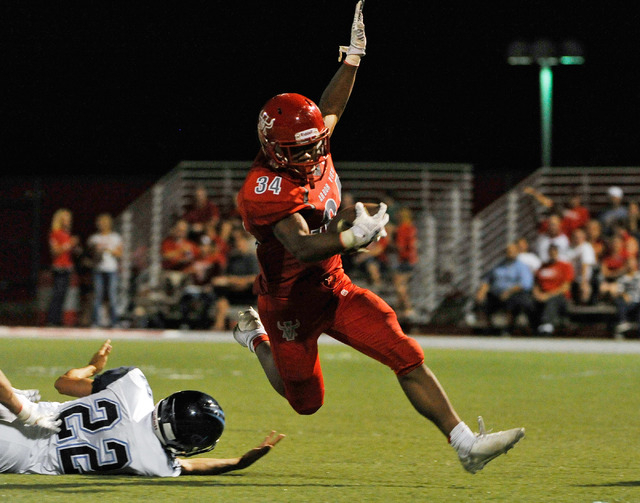 The Pioneers finally got on the board when Bradley Alexander connected with Ezequiel Lopez for a 12-yard TD pass midway through the second quarter, but Arbor View answered with a 16-yard TD sprint by Denajiou McZeal and a 42-yard field goal by Carter Andade to make it 37-17 at halftime. In the second half, the Aggies were held to a 7-yard third-quarter TD run by Maurice Harvey, but they held the Canyon Springs offense back until a fumble helped the Pioneers score on a 22-yard run up the middle by D.J. Board midway through the fourth. Poster completed 4 of 8 passes for two touchdowns for the Aggies. Alexander completed 12 of 24 passes for 134 yards and a TD to lead the Pioneers. Clark 25, Faith Lutheran 13 — At Clark, the Chargers won their home opener by forcing five Crusader turnovers, including on each of Faith Lutheran’s first three possessions of the second half. Faith Lutheran (1-2, 0-1 Division I-A Sunset) got on the board first when Greg Benson hit Mark Rubalcaba on a 54-yard touchdown pass and Ryan Callan kicked the PAT. Clark (2-1, 1-0) responded with a 38-yard run by TyRek Wells to start an 81-yard touchdown drive. A failed extra point made it 7-6. Faith Lutheran connected again when Benson hit Christian Marshall with a 40-yard TD pass. Clark’s response was even more efficient, as Marquice Stuart ran the ensuing kickoff 90 yards for a touchdown. A successful Aquantay Morris kick tied the score. Clark seemed poised to take the lead late in the half before Marshall picked off a Kareem Warren pass with 1:33 to play. The Chargers turned the tables with 10 seconds left in the second quarter when Veuiki Taumoefolau snagged a Benson pass and scampered 14 yards to give Clark a 19-13 lead at the break. The Chargers took control in the second half by forcing and recovering a fumble on each of Faith Lutheran’s first three drives. By the time the Crusaders went on offense again Clark was up 25-13 with just four minutes to play. Clark was led by 111 yards passing from Nick Kinnard, 80 yards receiving by Stuart and 114 yards rushing on 12 carried by Morris. Faith Lutheran got 141 yards passing by Benson, 65 yards rushing by Marshall — all in the second half — and 86 yards receiving by Rubalcaba. Cheyenne 12, Spring Valley 10 — At Cheyenne, running back David Walker rushed for 74 yards and a touchdown to lead Cheyenne. Cheyenne (1-2, 1-0) took advantage of an Ashton Lawson interception to score on a 23-yard touchdown pass from Matthew LaBonte to Zavieh Harrell to cut the lead to 8-6. Harrell led the Desert Shields with 76 receiving yards. After recovering a Grizzly fumble, Cheyenne went on a nine-play, 44-yard drive and scored just before halftime on a 3-yard run by Walker to take a 12-8 lead. Midway through fourth quarter, Tasi executed an excellent punt that was downed on the Cheyenne 1-yard line. Two plays later, the Grizzlies tackled Walker in the end zone for a safety and cut the lead to 12-10, which ended the scoring. Durango 33, Bonanza 25 — At Bonanza, Luis Paulino and Leontre Austin each scored two touchdowns as the Trailblazers snapped an 11-game losing streak. Durango quarterback Jonathan Schofield threw for 220 yards and two touchdowns in the first half – 92 yards to Paulino and 11 yards to Noah Williams. In addition, Troy Smidt hit Paulino on a TD strike from 24 yards. The Trailblazers outgained the Bengals 326-91 in the opening half as Durango grabbed a 26-13 cushion. Bonanza’s DeShawn Williams took the second-half kickoff and raced 82 yards for a score, cutting the Trailblazer lead to 26-19. Austin answered 14 seconds later with an 86-yard kickoff return, and Durango led 33-19. Late in the third quarter, ByJon Large capped a seven-play, 57-yard drive with a 4-yard score, and Bonanza was within striking distance at 33-25. In the final period, Bonanza drove into Durango territory on four occasions, producing no points. On the Bengals’ final drive game, Bonanza scored on a fourth-and-6 from the Trailblazers’ 41, but the Bengals were called for holding and unsportsmanlike conduct and thus Durango held on for its first win since late in 2012. Paulino grabbed six passes for 147 yards for Durango (1-1), which had just 27 yards total offense after halftime. Austin led the Durango ground game with 73 yards on 19 carries and scored on a 1-yard run in the second period. Large led all rushers with 90 yards on 11 trips for Bonanza (0-3), which only threw for 53 yards. The contest was marred by penalities, as the teams combined for 19 flags for 186 yards. Green Valley 53, Shadow Ridge 21 — At Green Valley, Christian Lopez threw three touchdown passes and ran for another score as the No. 9 Gators cruised past the Mustangs. Lopez tossed touchdowns passes of 35, 8 and 52 yards and finished with 197 passing yards, all in the first half. He also scored on a 30-yard run for Green Valley (2-1) and finished with 93 rushing yards. De-Zhon Rogers opened the game with a 74-yard kickoff return for a TD for Shadow Ridge (0-2). Dexter Kie also had a 66-yard kickoff return for a score for the Mustangs in the first quarter which tied the game at 14-14, but Green Valley scored the next 40 points quell the threat. Albert Lake had a 90-yard kickoff return for a score in the first quarter and had a 21-yard touchdown run. He led the Gators with 134 rushing yards on 12 carries. Brenan Adams rushed for 93 yards and two scores for Green Valley. Isaiah Macklin led the Gators with three receptions for 103 yards, including a 52-yard touchdown. Silverado 45, Desert Oasis 14 — At Desert Oasis, the Skyhawks used a dominant first-half performance to rush past the Diamondbacks and pick up their first victory. Silverado outscored Desert Oasis 31-0 in the first half, getting huge contributions from tailback Deyon McKinney and quarterback Jarrett Alipio. McKinney scored three times in the first two quarters, with two short runs and a highlight-reel 73-yard reception on a screen pass just before halftime. The senior finished with 161 yards rushing and 130 yards receiving. Alipio broke free for a 54-yard touchdown run on the final play of the first quarter en route to 108 yards rushing to go along with 205 through the air. He threw a 42-yard scoring strike to Cyson Verville in the third quarter. Addison Lyon galloped for a 41-yard score for the Skyhawks (1-1) in the final quarter. Silverado finished with 400 yards on the ground and 605 total yards. Junior quarterback Qwade Huff scored both Desert Oasis touchdowns on runs of 5 and 14 yards and accounted for 198 of the Diamondbacks’ 269 total yards of offense.Tyshon McClintock chipped in with 61 yards on the ground for Desert Oasis (0-3). Foothill 56, Valley 6 — At Foothill, Foothill used a big first half to take control of the game and cruised to the home victory over Valley. Falcons quarterback Devon Mueller completed 9 of his 10 passes – three for touchdowns – and racked up 164 yards. Aeden Bartolowitz caught three passes for 85 yards and scored twice. Eric Fisher added a 57-yard touchdown catch. A 42-yard run from Justice Jackson just over a minute in started the scoring for Foothill (1-2), and Mueller found Bartolowitz under three minutes later for a 40-yard score. Merritt also got in the end zone with a 17-yard run with just over a minute left in the opening quarter. Mueller found Fisher and Bartolowitz for scores of 57 and 15 yards, respectively, in the second quarter. Jackson added his second touchdown near the end of the half as the Falcons went into intermission up 40-0. For Valley (0-3), Tyler Ford caught a quick pass near midfield, and his lateral to Jaesion Flores went for 47 yards and the only Vikings score. Foothill added two final touchdowns in the fourth on a 1-yard plunge from Nick Gardner and 72-yard score from Kyle Lindley. Mojave 50, Pahrump Valley 6 — At Mojave, Ty Flanagan ran for 252 yards on just nine carries, scoring on runs of 35, 53 and 99 yards to lead the Rattlers over the Trojans. Zack Arave and Davion Fletcher each rushed for a touchdown, and Flanagan added his first two scores to give the Rattlers a 30-0 lead after one quarter. Flanagan halted a Trojans drive early in the second quarter with an interception at the 1-yard line and two plays later took the handoff, broke a tackle and flew down the sideline for a 99-yard touchdown. Lamaja Cunningham took over at quarterback for the Rattlers (3-0, 1-0 Division I-A Sunset) in the second half and contributed a 60-yard rushing score and a 20-yard touchdown pass to Marcus Parker. Jeremiah England finished with seven receptions for 109 yards for the Trojans (1-2, 0-1). Boulder City 32, Rancho 13 — At Rancho, senior Trenton Carmell showcased his value, passing for two touchdowns, running for another and intercepting a pass for Boulder City. The Eagles (2-1) orchestrated two scoring drives and dominated the first quarter behind the arm of Carmell, who threw the game’s first score of 37 yards to Austin Wishard and hit Brooks Roe with a bullet to the 1-yard line. Carmell finished the drive with a 1-yard wiggle into the end zone. Rancho (0-3) was hurt on special teams, as back-to-back punts were blocked in the third quarter, one of which was recovered for a touchdown by Justin Rockenfeller. Junior Robert Howard finished with 29 carries for 137-yards for Ranchom, which only completed three passes during the game. Sierra Vista 64, Western 0 – At Western, Sierra Vista’s defense forced seven turnovers, including four interceptions returned for touchdowns, to keep the Mountain Lions unbeaten. Sierra Vista’s defense started the pressure early, forcing a fumble on Western’s second play of the game and recovering it at the Western 29-yard line. 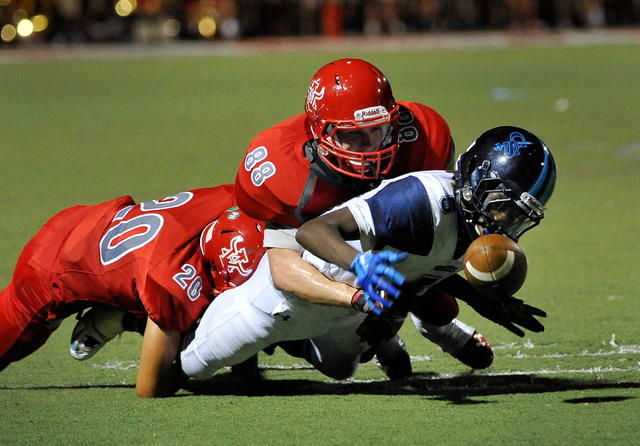 Two plays later, Andrew Peterson opened the scoring for Sierra Vista with a 14-yard touchdown run. Peterson finished with four carries for 61 yards and two touchdowns, adding two more touchdowns on returns after intercepting Western quarterback Wyatt Rozea twice in the first half. Maliek Broady added two touchdowns on runs of 68 and 43 yards on back-to-back possessions for Sierra Vista (3-0, 1-0 Division I-A Sunset). Western (0-3, 0-1) was held to 18 yards rushing and 123 yards passing. Miles Snyder made five catches for 70 yards for the Warriors. Chaparral 45, Sunrise Mountain 0 — At Sunrise Mountain, Richard Hernandez scored three first-quarter touchdowns to lead Chaparral. Hernandez finished with 61 yards on eight carries, and sophomore Jacob Ford added 50 yards on eight rushes. Cowboys quarterback Jerome Williamson completed 8 of 11 passes for 172 yards and two touchdowns to help put Chaparral (1-2, 1-0 Division I-A Sunrise) up 45-0 at halftime. He sat out the second half. Senior receiver Seitu Wyche caught a 70-yard bomb from Williamson for a score in the second quarter and added 43 yards and a touchdown on the ground. Maharie Trotter caught a Williamson fade pass in the corner of the end zone from 15 yards out for the Cowboys’ final touchdown. 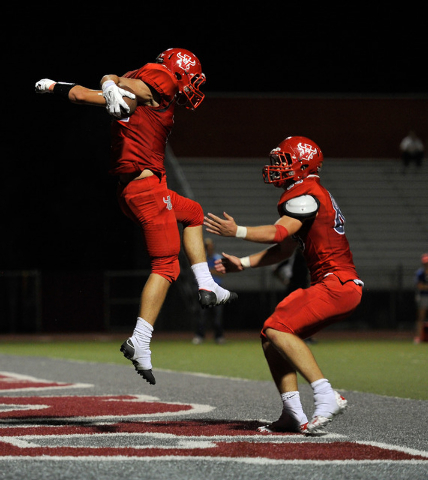 Adrian Zarate connected on a 20-yard field goal and convered all five of his extra points for Chaparral. Sunrise Mountain (0-3, 0-1) was led by Ja’terrius Parks, who carried the ball nine times for 31 yards. The Meadows 21, Battle Mountain 14 — At The Meadows, junior wide receiver Ethan Fridman hauled in two touchdown passes from Jacob Gleason, carrying the Mustangs past the Longhorns. Fridman caught a 5-yard score to cap a nine-play, 67-yard drive to make it 14-7 with 44 seconds left in the first half, and added a 29-yard TD grab at 1:05 left in the third quarter to help The Meadows take control, 21-7. Battle Mountain’s Jaren Price caught a 29-yard TD pass from Bryan Chavira to cut the deficit to 21-14 early in the fourth quarter, but the Longhorns turned the ball over on downs at The Meadows 20-yard line after a 59-yard drive with 5:40 left to go. Jack Berkley supplied a 2-yard TD plunge for the Mustangs to make it 7-0 in the second quarter, and had a key 3-yard first down run on a 4th-and-2 with 2:03 left to secure the win. Ivan Chavira provided a 1-yard TD scamper for Battle Mountain to tie it at 7-7 in the second quarter. Gleason passed for 149 yards, with 95 yards to Fridman for The Meadows, which got interceptions by Adam Martinez and Max Hisatake. Ivan Chavira contributed a 70-yard kickoff return and a 42-yard punt return for the Longhorns. Agassi Prep 56, Lutheran (Calif.) 20 — At Chula Vista, Calif., Kobe Williams scored five touchdowns to lead the Stars (1-1) past Lutheran. Williams returned the opening kickoff 85 yards for a score and tacked on three touchdown runs and an interception return for a touchdown in the second quarter as the Stars built a 50-14 halftime lead. 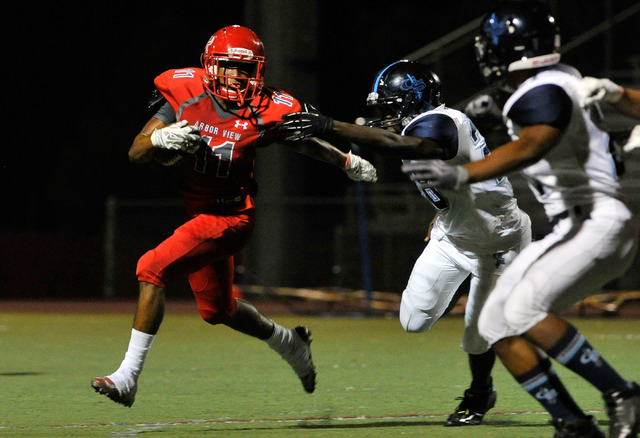 Stephan Laushal ran for three touchdowns for Agassi Prep, which also got a rushing touchdown from Cajon Lakes. Spring Mountain 16, Beatty 0 — At Beatty, Norman Crawford ran for a 60-yard touchdown during the second quarter to helpthe Golden Eagles defeat the Hornets. Jarron Belvin added a 9-yard run during the fourth quarter for the Golden Eagles (2-1, 1-0 Division IV Southern). Spring Mountain opened the scoring with a safety in the first quarter when Beatty’s (1-1, 0-1) punter recovered an errant snap in his end zone. Tonopah 59, Quest Academy 40 — At Tonopah, Scotty May ran for 192 yards and five touchdowns to lead the Muckers past the Knights. May also caught a touchdown pass. He finished with five catches for 62 yards. 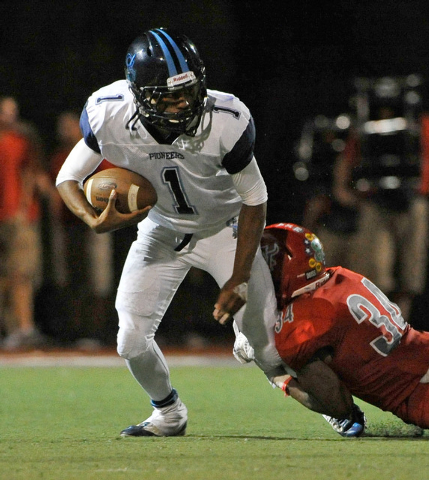 Quarterback Kiegan Ross kept the Knights in the game. He ran for three touchdowns, passed for one and scored on an interception return.